Analyst firm Gartner predicts that by 2022, more than 50% of enterprise-generated data will be created and processed outside of the data center or cloud, up from less than 10% in 2019. As a result, businesses are increasingly leveraging both hyperscale data centers and cloud deployments closer to the edge to support their IT strategies and digital transformation initiatives. 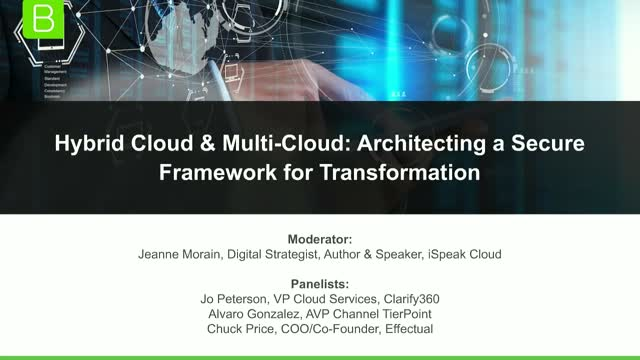 Rapid growth in multicloud IT deployments is driving an increased need to consider options for connectivity. Dedicated, fast, and globally-reaching connectivity is key to bringing the cloud closer to the edge where businesses reside and need services. Join TierPoint and Megaport for an in-depth look at two multicloud use cases. Our experts will give their insights into how the demand for both hyperscale and edge computing can be combined with cloud connectivity to make cloud strategies a reality. IT leaders and their teams are under great pressure to keep pace with escalating and often conflicting business demands, putting them in a state of perpetual transformation. As traditional solutions are replaced by more agile but also more complex models, even the strongest teams are challenged to design the right mix of workloads, environments, and security measures. This session will review the shifting IT landscape, the factors contributing to digital transformation, and the opportunities created for today’s IT professionals. The Donald Danforth Plant Science Center, a TierPoint client, is the world’s largest not-for-profit plant science research institute, with a mission of improving the human condition and helping the planet feed a growing population. IT Director Vince Abernathy discusses his team’s role in supporting the Center’s mission, how they select vendors, and why they chose TierPoint for disaster recovery as a service (DRaaS). Business disruptions are not just inconvenient but can significantly damage a company’s reputation and bottom line. Many businesses are turning to Disaster Recovery-as-a-Service (DRaaS) solutions as they have effectively solved for downtime and data loss due to weather, system failures and human error. Moreover, DRaaS solutions are effective against cyber threats. Indeed, it’s not just the weather we should be worried about when it comes to disasters. One of the fastest growing types of attacks in recent years is ransomware. When infected, files and data are locked down and held hostage until a ransom is paid to the anonymous attacker. Due to the nature of DRaaS solutions, your organization is protected against ransomware thanks to available, continuous copies (or snapshots) of your data as well as processes to help fail back to regular operations. In this session, David Hines, Vice President of Architecture and Engineering at TierPoint will review the latest in ransomware tactics, and how to best prevent malware from entering the network in the first place. Sometimes, however, this is unavoidable and having a plan to mitigate the damage is a necessity. You're hearing all about "digital transformation," but is it real? What does your business really need to compete? As IT leaders, digital transformation puts more pressure on your cloud strategy – expectations to achieve more, faster. Is the public cloud the answer to all your needs? How could a hosted private cloud help advance your cloud strategy? Is your hybrid cloud implementation falling short of expectations? Join Frost & Sullivan, TierPoint, and VMware for straight talk about digital transformation. We will discuss the challenges and opportunities of the digital era, and offer tips on how your business can succeed. Digital transformation initiatives such as business intelligence/analytics, machine learning and artificial intelligence, and big data are top priorities for IT organizations in 2018. Toward that end, according to a recent 451 Research survey, a full 60% of more than 1,000 IT leaders surveyed report that they plan to run the majority of their IT off-premises by year-end 2019, including public cloud and SaaS. At the same time, a number of organizational, cultural, and technology challenges have kept almost two-thirds of IT executives from developing formal digital transformation strategies. What is the path forward? What does the off-premise landscape look like? What are the key elements of a successful strategy? Melanie Posey, research vice president and general manager, Voice of the Enterprise at 451 Research will delve into the data and strategies IT organizations are implementing to facilitate this strategic shift and arrive at the point where they can focus on helping differentiate their business, rather than merely keeping the lights on. Every day, we hear about Artificial Intelligence (AI) invading more and more of everything around us. Within Information Security, we cannot get around new algorithms, new machine learning techniques, and a rush to automate everything. However, have these new technologies paradoxically ushered in a completely new world of vulnerabilities? In this webinar for technical and non-technical business leaders, Carl Herberger, Radware’s Vice President of Global Security Solutions, explores a fascinating topic of how everything from APIs to people are being attacked in a new, hidden attack surface with a unique ability to cloak and anonymize its designers, and which has incredible speed and efficiency in its attack types. This presentation will highlight how each step towards deeper and total connectivity comes with consequences of needing to protect the very automation designed to make our world easy. In this session, you will learn how everything from humans to bots have weak undersides to automation and even AI interfaces can be duped into attacks. A frequent guest of Fox Business News, CNN, CBS Evening News, CNBC and Bloomberg Broadcast News, along with numerous NYT, WSJ and Washington Post citations, Herberger will share his insights and answer your questions about this important topic. Mr. Herberger is considered a foremost expert on the problems and solutions surrounding cyber attacks. In his role at Radware, he is responsible for developing, managing, and increasing the company's security practice, and serves as the primary corporate spokesperson in the Americas for security-related topics. Previously, Herberger held senior security leadership positions at Evolve IP, Barclaycard, and a top-five IT security consulting organization; he co-founded Allied InfoSecurity, Inc.—an international provider of best-in-class security consulting and technical compliance services; and served at the Pentagon. As today’s businesses come under attack from increasingly malicious cyber threats, a traditional “defense in depth” strategy may become insufficient to effectively fend off attackers and prevent business disruptions and downtime. As mobility, IoT, and BYOD open new attack vectors and attacks become more sophisticated, the situation only worsens. While 100% prevention is impossible, rapid identification and containment is not. In this live webinar, TierPoint Director of Security Product Management, Brian Anderson will discuss why we need to redefine defense in depth approaches to safeguard data from emerging threats. • The implications of the disappearing network edge.